UPDATED August 25, 2011: If you have a Zx3 with the charging issue, read through the article, but be sure to see the notes at the VERY bottom about how you MAY be able to work around the problem if you are out of warranty. UPDATED August 24, 2011: Beth LaPierre, Chief Listening Office at Kodak, was responsive to my comments about our experience with the Zx3 and worked with me to find an agreeable solution. After shipping back camera #4, we will be receiving the newer model Zx5 with its own one year warranty. I believe that is a fair handling of our issue. Still, there was no “official” word from Kodak that this is as widespread of a problem as the hits on this site would indicate. Just in August, there have been over 740 hits on THIS article alone. I still believe it would be a chance to Kodak to turn lemons into lemonade for everyone (including overall consumer relations) to possibly issue a recall or at least make public their acknowledgment of this issue. UPDATED August 12, 2011: The charging issue has cropped up again, this time on the FOURTH camera in a year. That means that, under the warranty, we will have needed at least five Zx3 units to make it through twelve months. The problem started a couple of weeks ago, but I’ve been too busy to sit down and begin contacting Kodak about it again. It gets a bit discouraging to have to do this over and over for a simple consumer product. Does anyone have any experience with the newer Kodak Zx5? These are all individual search terms people put in search engines just in the month of April. Houston, we have a problem. Kodak, will you acknowledge it? UPDATE FROM MARCH 2011: After having the third camera for half a year, the problem started happening again. In speaking with a tech support rep through chat, he indicated that this was a firmware issue (!!!???). Firmware? He had me to pull the battery out and the memory card and try plugging the charger into the camera. The camera wouldn’t charge or come on. I got it to flicker for just a fraction of a second by adjusting the charging cable where it enters the camera. That was it. Kodak needs to fix this problem and redesign the charging port to be tighter, stay tighter, not loosen up over common, every day usage and KEEP CHARGING the camera like it is supposed to. Otherwise, they are telling consumers that they are out of luck dealing with Kodak. (What DO you do when the warranty runs out on what might be termed a shoddy product?) Kodak, time to weigh in. I thought it might be helpful to someone else to post the results of a recent CHAT session with Kodak “support.” The issue is that the supposedly waterproof camera Kodak makes wasn’t charging the battery after only a few days of use. While I have mixed feelings at this point about the camera and Kodak’s “support,” I must say that Best Buy was very easy to deal with on the returns. Items marked in RED indicate an inordinate amount of wait time for a response from the Kodak “support” representative. KODAK (16:02:57 PM): Welcome to Kodak, my name is Axxxxxx . Please wait while I review your question. 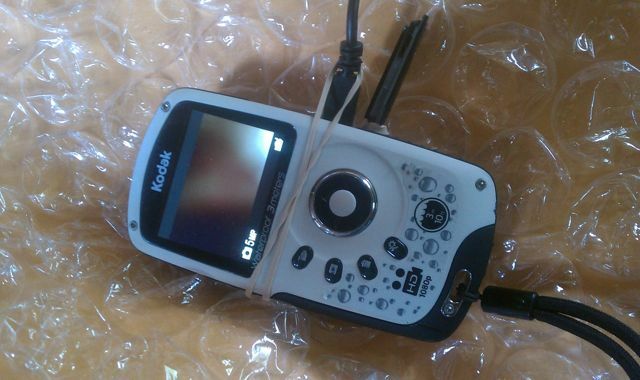 KODAK (16:10:10 PM): I understand that your Kodak Playsport video camera Zx3 is not charging after using it into the pool. Is that correct? KODAK (16:12:39 PM): I see. May I have the serial number of your camera? It is located at the bottom part of your camera and it starts with a letter “K”. KODAK (16:15:22 PM): Thank you. I will be providing you a case id number for your future reference, 6577XXX. CUSTOMER (16:15:59 PM): why is this happening? CUSTOMER (16:16:01 PM): is it common? CUSTOMER (16:16:13 PM): is this really waterproof to 10 feet (more than once)? CUSTOMER (16:16:22 PM): were there a bad batch of these with this problem? KODAK (16:17:23 PM): What is the ft of the pool when daughter is using your camera? KODAK (16:18:26 PM): I see. KODAK (16:18:52 PM): Have you tried to use a new set of battery? CUSTOMER (16:20:36 PM): is this common in these models? KODAK (16:23:52 PM): I see. Let me check on that first. KODAK (16:27:04 PM): No, it’s not common. CUSTOMER (16:27:51 PM): what am I as the consumer supposed to come away from my experience with this Kodak product? KODAK (16:28:04 PM): What we can do is to send you camera for repair, but we’ll give you a prepaid label for free shipping of the camera going to the repair center. KODAK (16:29:33 PM): Alright. I understand how you feel right now. KODAK (16:30:43 PM): Can we try the last troubleshooting to determine if the problem is with the camera or the battery? CUSTOMER (16:32:02 PM): what should we do? KODAK (16:33:33 PM): Try to charge it without the battery inside. KODAK (16:37:00 PM): Alright. It appears that your camera requires service. KODAK (16:38:02 PM): I will provide a prepaid label for you for the free shipping of the camera going to the repair center. KODAK (16:44:41 PM): Yes, still here. KODAK (16:44:57 PM): Sorry for the late reply. I need to refresh my tools. KODAK (16:46:34 PM): Yes, I understand the frustration. The camera is waterproof. However, we usually suggest that if the camera came from charging. You need to wait for a few minutes before you will use it underwater. If you take the camera from a hot place, let it wait for a few minutes before you will use it underwater. Right now, what we can do is to set the camera for repair so that the repair center can check if it is a manufacturer’s defect or not. So, let’s see: I spent about 40 minutes on the chat just to be told that, yes, the camera IS broken and needs to be replaced. No real indicator as to whether or not Kodak has seen a LOT of this or whether or not a person could go through 10 or 20 of the units before finding one which actually works as advertised. This may not work for you. While I was waiting for Kodak to respond on camera #4, I spent some time wiggling the USB cable back and forth in the charging port. My contention has always been that this is a design issue. What I found is that holding the USB cable a certain way would SOMETIMES allow the camera to charge. If you’re like me, you don’t have several hours to nurse a consumer product. So I rigged up a moderate solution with a rubber band. If you pay attention to the way it is set up, you will see that I have stretched the bands on the FRONT of the camera to add extra tension to the USB cable one certain direction. The other end is secured around the door/cover of the USB port. (You can see it.) If this works for you, great. If not, I don’t know what to tell you other than to try Kodak customer service. Remember: there are a LOT of people searching for terms related to this problem, and hundreds of them per month are reading this article. Let your voice be heard. can some one help me please…. my kodak sport camera will not charge, when pluged into the mains or a laptop the white light comes on for about 5 seconds and then disappears,hense the camera is not charging, is this a battery issue or what…. It might not be a waterproof issue. I have had a TWO Playsport Zx3 cameras charge the battery and work great for a few days and then the cameras DIED. They chagred overnight successfully for a few days and then one day after a normal overnight charge (the light was on when I plugged it in and was off in the morning) the camera was just DEAD in the morning. Both units were NEVER IN or NEAR water. Both units were always charged from the wall outlet (not via PC USB). Some said my SDHC card was too fast (was 16GB Class 10 on first camera). I replaced with 8GB Class 6 card on 2nd camera and got same results. This might be a battery problem? This might be (likely?) a camera software problem? Note: I DID NOT upgrade the camera’s software on the first two cameras. I will be upgrading to the newest software when I get the 3rd camera. I will also be testing my old battery in my new camera and vice versa to determine if the old battery was actually charged or if the battery is bad – will not take a charge and also to see if my old camera comes alive with a new battery charged in the new camera. If none of this works, I am returning the camera for cash. But I do not know what to buy since I have read that a lot of people were having FLIP cameras also freeze or DIE, and the BLOGGIE just takes poor video. Just bought a Playsport from The Source (Radio Shack)plugged it into the wall for the initial charge and the power light turned off after a couple of minutes so I thought the battery must be already charged. Turned on the cam and saw the low battery icon just as it turned off. Plugged it in again and the light was still on the next day but still dead, tried from the PC, no difference. Cleaning the contacts made no difference. Playsport Zx3 with less than 30 minutes of use. Pristine camera. Never in water or rain. Always in a case and then blammo no charging and no camera. Good news is that Kodak seems to know exactly what is wrong and they are repairing them UNDER WARRANTY. But you pay to ship it back and the rest of the support time wasted trying to figure out why a new camera does not work. Not a good move for Kodak at all. And if you are thinking of purchasing a unit, be aware that there are likely many refurbished units hitting the streets as a result of the repairs on the cameras. Update: I have had success in fixing this problem. This is after I found out that Kodak South Africa does not support a product bought abroad. I wonder if Kodak UK agrees with that statement. Anyway -here is what I did: As I said, when connecting the charge cable to the camera it switches off after 2 seconds. I tried un-plugging it within that time, and got the little ‘kodak’ shut-down screen, and it seemed to switch itself off ‘in the propper way’. Next time I connected it booted and the charging light came on and stayed on. I have it fully charged now. It seems that perhaps one can run the batery down to a point where it has not shut-down properly -preventing it to go into it’s charging sequence? Worked for me, hope it works for others. I have had my Kodak PlaySport Zx3 video camera just 2 weeks but did not attempt to charge it until I received my SDHC card on 3/12/11. Charged my camera in hopes of testing the camera out over the weekend. It seemed to charge ok on the evening of 3/12 and I made all adjustments on the setings, i.e. time/date, etc. turned the camera off and went to bed. The next morning, I excitedly attempted to turn the camera on…NOTHING. I sent an email to Kodak and was provided several “tips” to try. Did not work. So I completed a web-search to se if others had experienced similar problems. Thank God for the Thompson reviews; the situations read just like mine. I plan to start with Best Buy as well; however, seems Kodak should do a voluntary recall and replace/fix the problems. Thanks so much for your postings that really helped with my situation! I researched the Kodak Playsport for a couple weeks from prices and reviews, oddly all the reviews I found were positve, untill I got a playsport (granted used from ebay, but from a high rated seller with a return)and you guest it, it would not charge! And Kodak was not much help except that it was underwarrenty and to send it in. Only then I found the “bad” reviews and now I think I should of just return it and forget it. I am now thinking that maybe getting a battery charger and a card reader might help (by bypasing the usb connector).